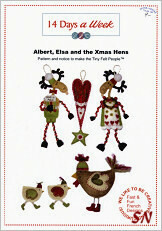 We have Scissor Fob kits, bookmarks, and small charts all featuring Michaels charming signature artwork. 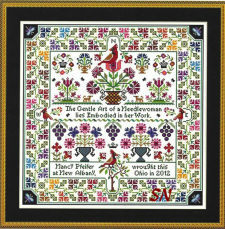 Brilliant colors, everything is worked in regular WHOLE Cross Stitch, he just likes to add all the backstitching that goes 'herky-jerky'/hither-and-thither' everywhere! How can these NOT make you smile??? 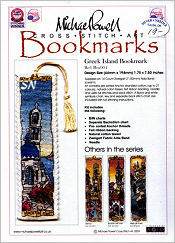 Click the pic to see the bookmarks and small designs -- both pictures and those awesome fob sets! (And DO NOT hide your bookmark in a book -- frame it, for heaven's sake!) 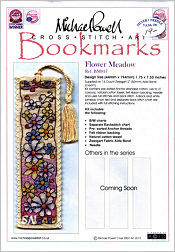 and... watch for matching design across the offerings -- fobs that match bookmarks, that sort of thing. Just Another Button Company has the most delightful set of alphabet letters and the ampersand to spell out words and names! 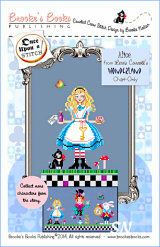 These are perfect to use to teach a beginning stitcher! They are actually white 5-1/2 inch squares of 14ct perforated paper that JABCO has printed with stripes, spots or hearts of beige, pinks and greens. Each letter, also printed in black on the paper, features its own background... meaning all the M's have the pink stripes, but other letters have different colored stripes! Stitch a little or a lot -- they have charted only a small floral design for each, and provided buttons for garnish. You supply the bits of floss from your stash. SO cute, colorful, fresh, bright, clean and cheerful... you can stitch just one initial or spell out a huge long greeting! Just depends on your budget! Frame or finish on scrapbook papers -- you decide. 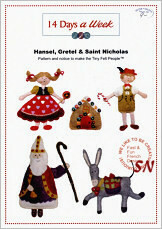 We have two new leaflets that follow the months with Fairy Tales and Storybook motifs! 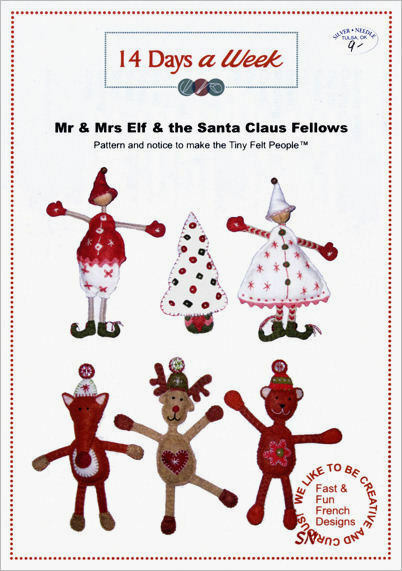 Each pattern features smaller panels, so you could break these apart and stitch just your favorites -- or those that enchant a special little person in your life! Coded for DMC. Once Upon A Time -- I LOVE this one! 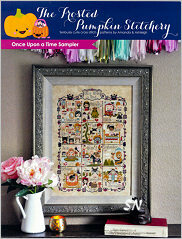 Each Fairy Tale is told in a 5 x 50-ish size design space -- the whole thing measures 12-1/2 x 17-1/2 on 28ct. 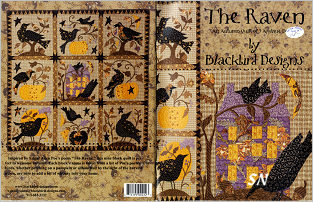 I can find the toad ready to be kissed... Three Little Pigs, Goldilocks and The Three Bears, Jack and the Beanstalk, The Princess and the Pea, Rapunzel, Cinderella, and Little Red Riding Hood... 12 tiny tales in all! 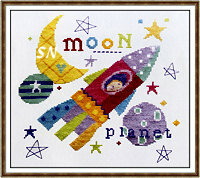 Story Time Classics -- Features all different stories, and these are 30 x 55 in stitch count size and shape, so the whole piece finishes approx 8-1/2 x 11 on 32ct. Alice in Wonderland, Sherlock Holmes, The Wizard of Oz, Old Mac Donald's Farm, Peter Pan, Phantom of the Opera!, A Christmas Carol -- I think Annie Oakley is in here too! 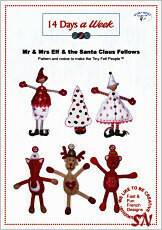 Too darn cute, these belong on the walls in your book nook, or classroom... or baby nursery! We have a new lamp!!! 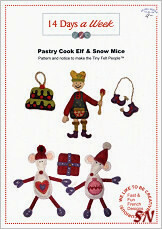 Long awaited from Craftlite... it has Tons of features!!!!! Use it as either a Table-Top or Floorstand Style -- you choose, simply add one or two lengths to the stick -- they are lightweight pipes... they just screw together. 5-Inch rimless magnifying lens -- with handles to help you guide to just the right spot! THREE levels of LED light!!!! Dim -- kind of a gentle *night light* level. Daylight -- Brighter and cleaner. Brilliant White -- Super Bright! Internal rechargeable battery! We pulled ours out the box and turned it ON! There is a plug-in for the wall as well. The little Project Tray and Table Clip pieces that fit the Dublins also fit this lamp!! Light-weight enough to travel with, this all comes in a box that is only 10 x 16 x 4, and it weighs about 8 pounds. The 8 x 10 x 2-ish rounded base is VERY stable as well. We sell a ton of Dublins... but this little guy seems to be the next generation of that light. We are very pleased with it! Craftlight has a new lamp that is slightly larger than their little Dorset!!!!! A new updated style, this little guy is awesome! It is a table-top lamp and weighs 6 pounds. It features a 16w fluorescent daylight-balanced light bulb surrounding a 5-inch glass, 3-diopter lens. The bulb is completely covered on the bottom side for safety. The lamp plugs into the wall... It has a little flip-cover to protect the lens when not in use... a toggle on/off switch, and 8 x 9 base with lots of tiny storage areas for needles, scissors, pencils, just whatever. The main part of the arm is 12 inches in height, so it has a really nice table-reach. The 5-inch lens is wonderful -- so much more to see than the 3-1/2-inch of the Dorset! No assembly required... pull it out of the box and plug it in! Offered in white, this is a LOVELY lamp!!! The Glasshopper has made lovely sets of hand-made Lampwork Glass flowers and leaves -- on pins. Poke them into your favorite pin cushions, and dress up sewing cases -- these are too pretty to hide away in a drawer. 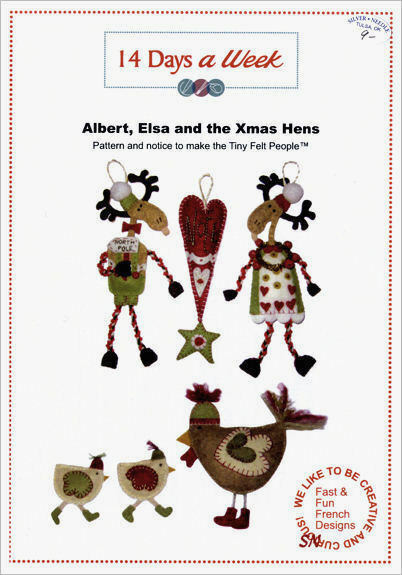 You'll recognize these from your Blackbird Circle of Friends Kit we sent you -- if you are in our Circle of Friends Club! Each flower or leaf is individually made of molten glass on a metal rod -- being warmed and shaped right in the flames of a blow torch!!! Jennifer has made us several colorways to match your stitching! They DO NOT MATCH THESE DMC NUMBERS I AM REFERENCING... but are close, in my opinion. All have a tiny yellow center, except the red. We have red with a tiny black center 816, lavender-- 3041, lt yellow -- 746, blue -- 322, slightly iridescent light blue -- 3325, white, and a light pink -- 224. I'd get the pins first, then match hand-dyed flosses to them!!!! We have just a few of these exquisite hand-made stick-pins from Italy! I fell in love with them... just because they are small and beautifully decorated, and I personally cannot pass up Italian pottery of ANY kind!!! 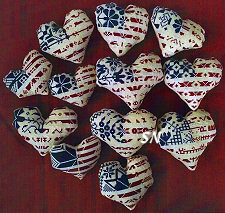 Each is different, each features a 1/2 inch pottery bead along with pearl and silver bead accents. 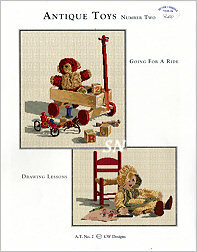 DEFINITES for a special pin cushion or sewing case. You know, you come across all these gorgeous pins here and there... don't hide them in a jewelry box or drawer. Paint a cool base from the big box store... and get out all your pins that belong to un-stitched projects and POKE IN YOUR CUSHION to enjoy till the stitching is finished!!! We have LOVELY pins from Just Nan, La D Da, The Glasshopper, JABCO, Puffin, and all these Italian we've brought home from Market -- USE THEM and ENJOY THEM!! Joining our regular Floral Needlecases are these smaller versions that are equally enchanting! Glass vials with a screw-off cap, these are lovingly covered with polymer clay and decorated with colorful flowers and tiny ladybugs. ALL THE COLORS of the rainbow -- absolutely no two cases are alike -- and it's IMPOSSIBLE to choose your favorite! (This I know -- because I keep trying to find my favorite to take home and add to my stash -- and I can't!) Measuring a mere 2 inches in overall length, use these for beading and petite needles or precious stones and beads. Delightful! 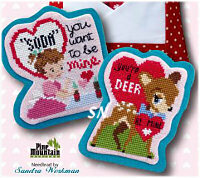 Pine Mountain is beginning a REALLY CUTE series -- small bits of stitched pieces that tuck into an envelope pillow! 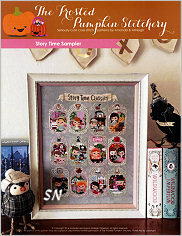 Vintage Valentines is Sandy's first release. Remember the little paper valentines we used to exchange in school? Your chart pack includes two charts for these awesome little 3 x 4 retro designs, along with the 28ct Baby Pink Linen they are stitched on, the blue wool felt backing for finishing, and full instructions. Finish them flat... OR get the really cool 9 x 11 *Sending My Love Envelope Pillow* -- this one is red polka dot. The white envelope on the front is actually a fabric pocket to tuck your valentines into!!!!! Sandy has ideas and plans for more -- Birthday Cards, Christmas Cards... Get Well cards... you get the idea... and will probably introduce a few more colors of envelope pillows in the coming year. So... you can get the valentine charts and fabrics by themselves or add that fun display pillow as well. Anyway, January finishes out the series -- love those red long-johns! Featured fabric is the 32ct natural/white polka dot Belfast which is offered separately. Oh, we've carried these forever and ever in the shop... they are wooden sheep painted and wrapped with nubby wool yarn... and each has a magnet on his backside so he's a needle minder! Measuring about 1-1/2 inches long and 1-1/4 inches tall, each sheepie is painted black and wound with either a creamy white or black yarn. They feature rare earth magnets on the back to grab onto your chart board, the refrigerator, your file cabinet... anywhere you want them to cling. Just cute as can be... choose between the white and black!!! 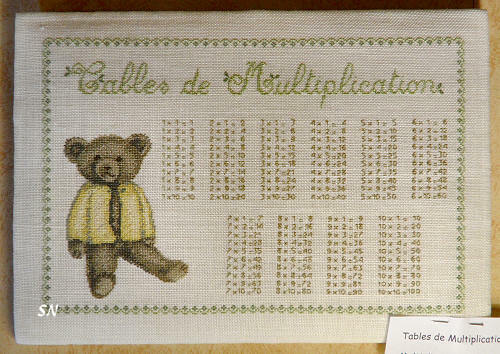 This is a precious multiplication table that might need to hang in the nursery of a budding mathematician! The chart is printed in French, so I can't read a word of it... but it is coded for DMC floss. 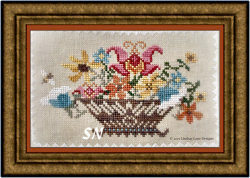 The stitch count is 170 x 260, so on 36ct, this would finish approx 9-1/2 x 14-1/2... plenty big enough to learn from!!! The teddy bear is so antique, beautiful and classic. 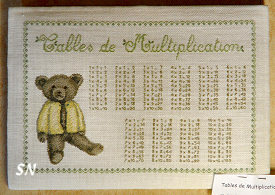 The multiplication table is so 'old school'... wouldn't this be neat in an elegant guest room as well? So unique, I couldn't pass this by! Offered as a chart, beautifully presented in color. 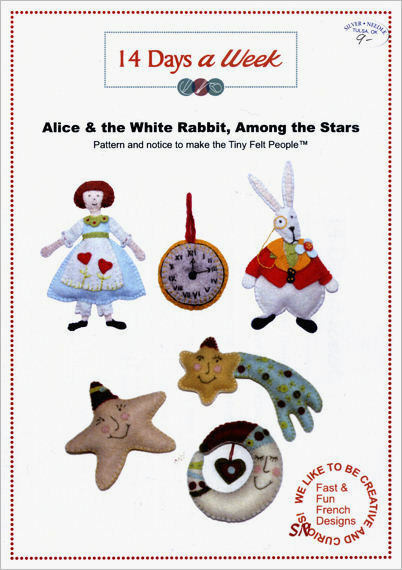 This is a nice start to what hopefully will be a cute set of Alice in Wonderland characters. Just three available right now (? on any more?)... 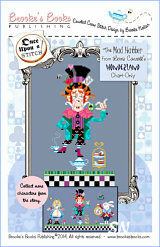 we have Alice, The White Rabbit and The Mad Hatter. 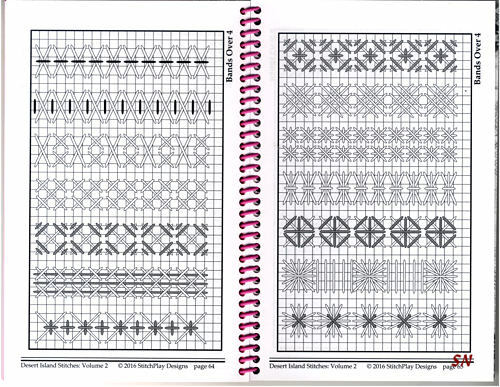 All offered in chart format, they measure 70 stitches high and approx 100-ish stitches wide, and are suggested on a denim blue or medium gray fabric. All three can be joined together because of that cool black, white and purple checkerboard bottom with the green grass! Just cute as can be, these are full of Brooke's charm -- and each one uses a TON of different DMC colors! Oh, what a charming scene of a girl in Paris for the day!!! 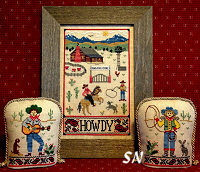 By Perrette Samouiloff, this 90 x 215 stitch count design finishes approx 6-1/2 x 15-1/2 on 28ct linen. You can split apart the elements to make some smaller pieces if you like -- just get that Eiffel Tower in them!!! Coded for DMC floss, this is just a simple thing that caught my eye! Do something fun with it! Offered as a chart. 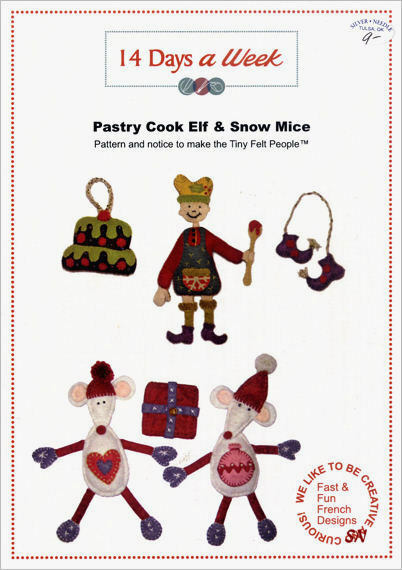 Oh my gosh, we have no business carrying these charming little patterns -- but I couldn't resist them! They are full-sized patterns to make *Tiny Felt People* that measure between 3 and 6 inches each. 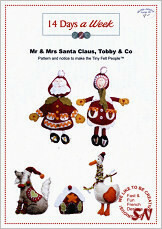 Santa and Mrs, lots of little elves, Little Red Riding Hood, (Grandma-the-wolf is knitting! 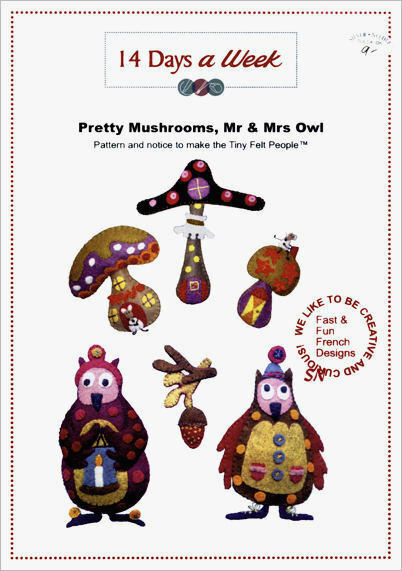 ), bitty animals and decorated mushrooms... 14 Days a Week is actually 2 sisters from France. They have written their instructions in English, and presented the piece templates actual cutting size. Lindsay Lane has a pretty floral basket to celebrate the last fleeting days of Summer. 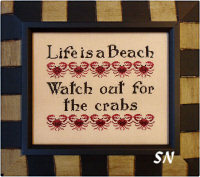 Just a simple thing, it needs to be stitched on a soft, neutral shade of whatever fabric you like best. It uses Week's Tarragon, Brick, Whiskey, Red Pear, Cognac, Cadet, Grapevine, Juniper and Parchment. Noteworthy Needle has cool little beeswax waxers for your threads. Pure beeswax, use them to strengthen and smooth threads and reduce tangles. 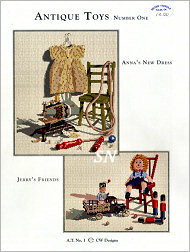 I remember my mom waxing her sewing thread when she was mending jeans and doing buttons. 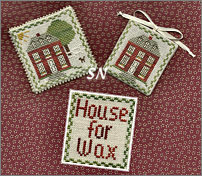 I wanted Janis to make something to store your waxers in... and she came up with this cute *House for Wax* Pocket! Since her waxers are various sizes... the chart can be worked on different count fabrics to accomedate the specific waxer sizes. 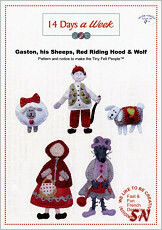 Stitch the house and tree, or just the house, make it into a pouch and bead the edges if you feel adventuresome. 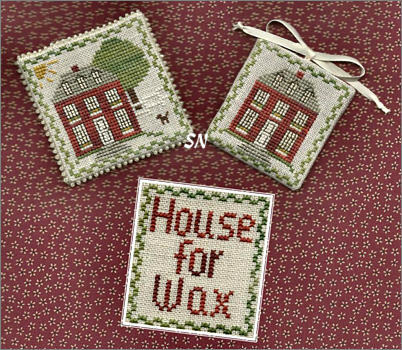 I think Janis's future plans are to design specific pockets for specific waxer shapes...but for now, we have this cute house to store our assortment of her waxers. Chart includes a waxer. Wow, this is a neat collection of Quaker-inspired motifs all organized into heart shapes! They are all stitched with ONLY DMC of 815 red, 311 blue and white, and are meant to resemble the US flag -- the blue in the upper left corner and then all the red and white stripes. That extra design elements really adds charm!!! You could choose virtually any fabric you like, and actually find some neat hand-dyeds in reds, whites and blues that you have waiting in your stash, and go to town with these. Stitch counts on them all run about 50 x 60 in size. What a unique set of coordinating pieces!!! All are offered in the chart pack. Faby Reilly has more 'pieces and parts' to her gorgeous Violet design set. This gal has the most beautiful florals -- all presented in Biscornu cushions, scissor and sewing cases. Wild Roses, Apple Blossoms, Iris, Peony, Poinsettias and Poppies, she has multiple charts for each flower, and each one is prettier than the last! Here are two new Violet offerings that are worked on 32ct Antique White Belfast linen. Charted for DMC, the charts are published by Creative Poppy, and are some of the most beautifully presented charts in the industry. (Pascale's company, Creative Poppy is in Paris, France, but she is living in Japan right now... we just sent some of her charts to The Netherlands last week... and we're in Oklahoma! We're all just everywhere in the world!!!) 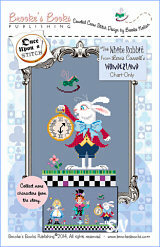 As with most of Faby Reilly's other designs, the scissor case and Needlebook are offered in separate charts. There's a little cowboy underneath the bubbles in a metal washtub... at least he remembered to take off his precious boots! The stitch count is 100 x 96, and the chart is coded for Sampler Threads of Barn Gray, Buckeye Scarlet, Black Crow, Cameo Pink, Sarsaparilla and white, along with a bit of opalescent to highlight the bubbles. 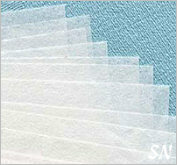 The suggested background fabric color is a light blue, so choose whatever count you like. 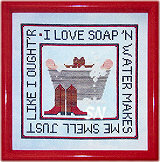 I think this is perfect to hang in a little boy's bathroom!!! 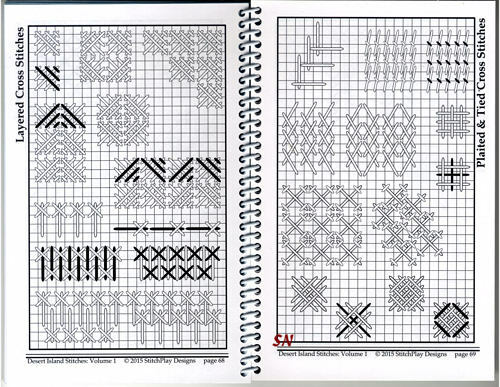 Offered as a chart -- direct from France, I think there are special stitches in here, but since I can't read French... I'll have to figure that out from the chart! 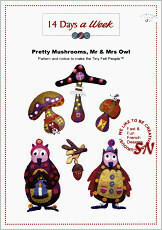 More cute editions from The Stitching Shed! 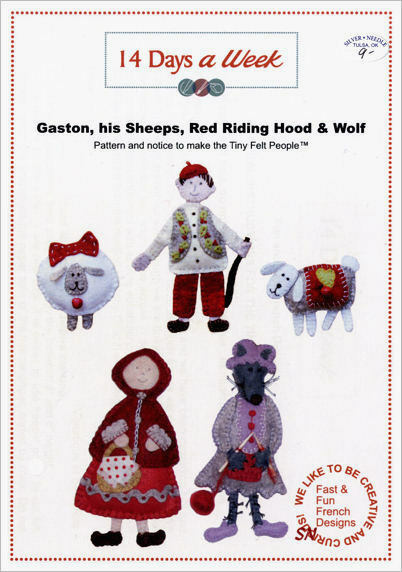 Absolutely the happiest palette of thread colors in these designs -- we just LOVE them all! They are Happy, Cheerful, Smiley, Bright and truly unique. Some are fun for a sunny kitchen window, but most need to find a home in the bedroom of some special little person of yours. Personalize them for bedroom signs or make bed pillows out of them... they are just the freshest, sweetest designs! All are coded for Anchor Floss -- if you don't have it, go on-line and look for a conversion to DMC. The cover pictures are clear enough that you could even just match up DMCs and hand-dyeds from those! Oh my gosh... I think this is laundry day!!! 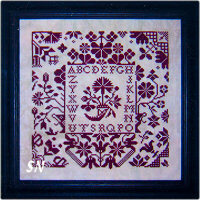 By Za Za Picque,(these come from France) this measures 110 x 79 stitches, is worked on an antique white linen, and coded for DMC or Gentle Arts Sampler Threads. I just love this piece! 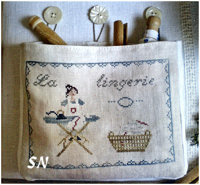 Wouldn't it be pretty in a laundry room... or even better... sewn onto the front of a lingerie traveler bag? If you are an *organic gal* -- stitch it for the front of your wooden clothespin basket! Offered as a chart. Isn't his little guy CUTE????? He is a THREE-SIDED pendant stitched on 32ct Antique White Belfast Linen with regular DMC flosses. Each of the three sides is an individual design -- Sonny, his mittens, and that charming top hat and bird perched atop. Each side measures approx 6 inches long and 3 inches wide. So if you construct this into the pendant, it'll make a generously sized tree ornament. So cute and different, you can trim up the edges a little and make a neat beaded hanger if you like. Offered as a chart. 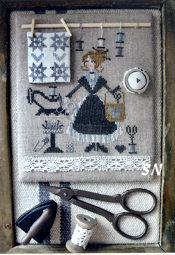 A cute needlework sampler... I love the pic! What a charming seamstress complete with straight pins in her hair!!! Stitched on a natural linen, the tiny quilt is on a separate piece of white and attached after it is stitched. (I think the mini-hoop in her hand is as well... but I don't know where to find that little bitty hoop!) The spools are Satin stitched, and the panel of lace at the bottom needs to be something special off an old handkerchief or something special to you. 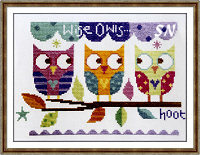 Just a cute piece to hang in your stitching room. Maybe a fun padded hanging to drape over the back of rocking chair?? Stitched with Gentle Art's Barn Grey, Heirloom Gold, Summer Shower along with DMC in black and flesh colors. Offered as a chart. Ask any historian, librarian or preservationist... sun, air, chemicals and all the elements in our air are the worst enemies for keeping our needlework looking young, fresh, clean and not discolored. Kreinik has packaged 12- 20 x 30 sheets of acid-free tissue paper and recommend that we use it to store and preserve our needlework. Unbuffered, museum quality, it prevents tarnishing and oxidation (changing colors), and will not scratch or mar your projects. Works to tuck between your fabrics, wrap silver charms and scissors... and preserve the original colors in samplers and finished pieces that you have (sinfully!) hidden away in your drawers!!!!! We've carried these charming glass needle vials over the years, and have a fresh new shipment to enchant you! Glass bottles -- 1/2 x 2 inches in size, each is covered with a wrap of exquisite handmade clay -- all in different colorful floral designs. Exquisitely done, each case is unique and full of brilliant color. 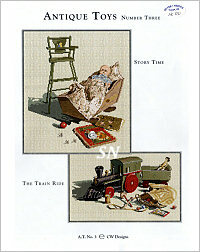 The black caps twist off. The details on the flowers covering the case are minute... the color vibrant and puckering... there are even tiny lady-bugs scattered throughout the florals. We've chosen a few to highlight in the pic -- as you can see, they are all different... and not 'red' or 'blue'.. but citrus, melon, violet, aquamarine... all the exotic colors of the rainbow. So... asst colors... we'll choose a pretty one for you, and if you want more than one... we'll make sure they are all different! Back in stock after many years... this threader has been the favorite for 'just-forever!' Formerly known as a *Muriel*... (named after the lady that designed then, I believe) you just found a new best friend! Muriel passed away several years ago, I remember something about the family not continuing with her product... we 'lost track' of them for several years... and found them again! Just a flat, thin, lightweight metal needle threader, perfect for thick and thin threads, the hole in the center allows you to teather your *Muriel* to anything else to keep track of her! Measuring just 3/4 x 1-3/4 of an inch... paper thin... this little baby fits anywhere and is a great help. Don't know if it is because it is solid and the holes to thread your thread through are so much easier to see than wire threaders, or the fact that there is NOTHING to break on these that make them so good, they have just always been the *Go To* Threader! 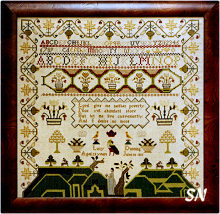 One of 3 more designs we have added to the Midnight Stitching page... it's a garden of motifs surround the nosegay and alphabet center. 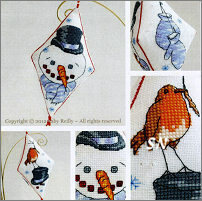 The stitch count for this is 123 x 128. Again -- choose a fabric you like, and ONE pretty hand-dyed color of thread, and this'll turn into a beautiful finished piece! Offered as the chart.